Register Log In ECN Forum Forums Photos for General Discussion Is this a Violation? This photo was taken in an industrial plant. The plant uses a lot of, pre-assembled, multi-conductor, flexible cables with MTW outer jacket insulation. These cables are usually run in cable tray. Each end of the cable has a male or female screw-on connector. There is a 15hp, 3 ph, 480 volt motor fed from the starter with one of these 50 foot, 6-pin cables. The connector at the motor disconnect failed. 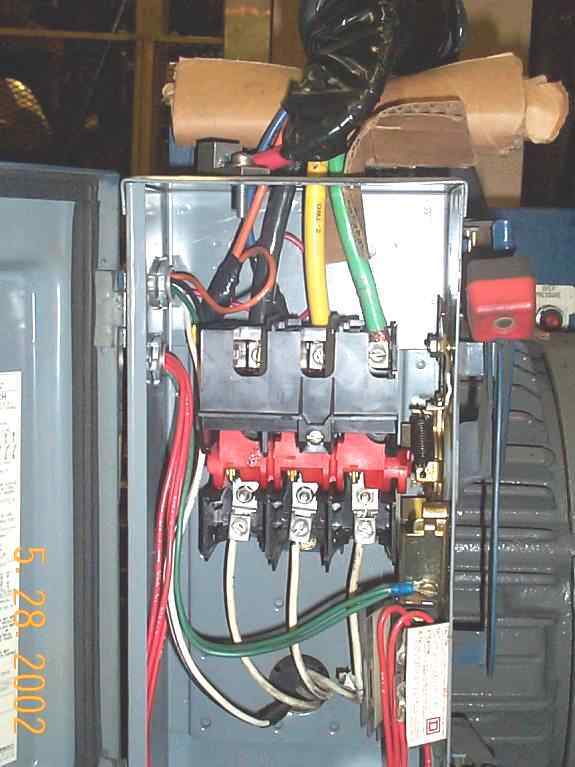 To get machine working, for production reasons, the bad connector/plug had to be cut off and it was discovered inside the cable a green #4 wire was used as one of the 480v power conductors and a red #4 wire was the ground (after some fuses were blown). The other two #4 power conductors were black and yellow. There were also two #14 wires for 120v pwr to unit. Even though these pwr conductors were internal to the cable and usually never accessed.… Is this a code violation?! Any comments would be appreciated. I’m not getting any responses so far. Hope I explained situation clearly. This motor disconnect was wired with, what I call, a male connector or receptacle. The color coding on the wires (pig-tail) from this male receptacle into disconnect were o.k.. I think the power conductors were all black and the ground was green. So when you plugged the female end of the 50 ft. cable into disconnect’s male receptacle, wiring to the observer appeared to be code compliant. No one ever knew that internally the cable had a green wire caring 480v and a red conductor was a ground. And we would never of known had we not been forced, by circumstances, to cut off the cable’s female end and wire it directly to motor disconnect. Is the manufacturer of this cable suppose to follow the NEC? We tried to pull the end connector off the new cable we received, to replace the one pictured above, but couldn’t without damaging or destroying new cable. So how do you check the wiring? We were told the cable manufacturer was notified of what we found. Hot green wire on feed? Hot white wires on load side? EGCs terminated to operating mechanism? Improper tap on line side? Was not done in a neat nor workmanlike manner. I was told once it was a violation to know the code and to intently not use it, And a violation to not know it and perform work within it scope. I don't know that either of these are referenced in the document proper, but still fine rules to live by and work by. When I first started to work and older gentleman would have me do and redo my conduit until it suited him, some was a little rough I admit, but I was learning then. He told me that you don't learn to good work by installing poor work, even if it would pass the code or inspector. So I would bend and rebend conduit until they fit just so. He told me a quality conduit installation will hardly ever be noticed, but a poor or unsightly installation will be seen by everyone. The red conductor as EGC violates Art. 250.119 and the manner in which it is attached violates 250.148. I don't have any more time right now, maybe there's more. Do you have a picture from a greater distance away. Is that mounted right on the motor where in place of the pecker head? I don't know why they color code the inside of a cable assembly at all. If it were all black, at least you guys would have paid closer attention to pin connections. I hate all the pre-fab cable assemblies nowadays. Including re-lock. I find myself not thinking about the circuitry as much, and just plugging stuff in. I also wish the NEC said you couldn't coil up excess in the trays also, and had to reterminate to length. Thanks for the heads-up on not trusting inside colors of cables. Somebody please phase tape the wires, or change pigtail at feed origin, and put a ground lug(s) in. Good eye, Lance. It does look like the motor leads connected to the switch. Finally, someone got the requirements for an isolated ground right the first time.